Notre Dame's IDEA Center, led by Bryan Ritchie (pictured), launched 27 startups in it's first 12 months of operation. Media excitement over the rise of startups and entrepreneurial funding in the Midwest is palpable. It’s difficult to find an industry publication or mainstream media outlet that hasn’t published its own version of “Silicon Valley tech’s great Midwest migration” like The Hustle or “As Silicon Valley Gets ‘Crazy,’ Midwest Beckons Tech Investors” like The New York Times. While Central Indiana has thus far received the lion’s share of attention in the state, there are nonetheless growing startup communities located near research universities and industrial centers like the one Notre Dame’s IDEA Center supports in the South Bend/Elkhart region in North Central Indiana. 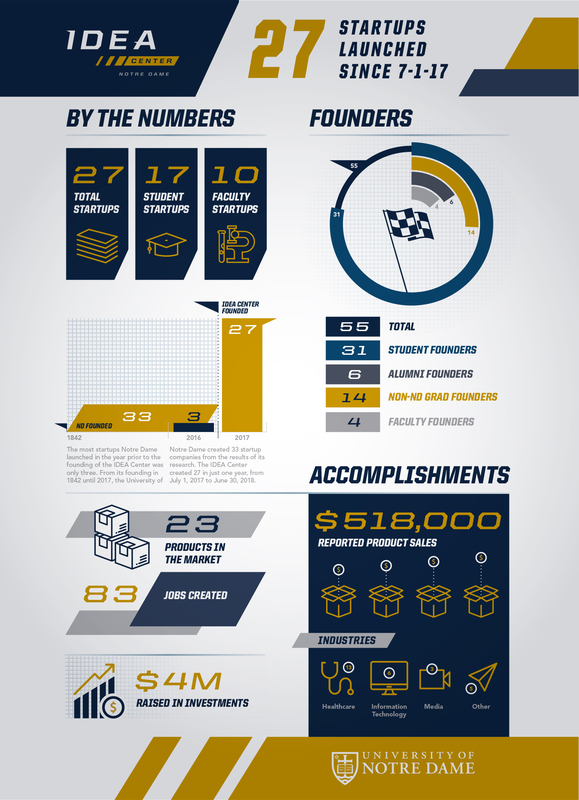 In its first 12 months of operation (July 2017-June 2018), the IDEA Center launched 27 startups and recently announced a $22 million seed fund for faculty, student, alumni and community startups called Notre Dame Pit Road Fund. Notre Dame’s IDEA Center on the 12-acre Innovation Park campus is situated across the street from the university. The state-of-the-art IDEA Center facility boasts 55,000 square feet of collaborative space that promotes creativity. Because the University of Notre Dame exists more as a global brand — likely due to its storied football team portrayed in films and on TV — people are sometimes surprised to learn that it’s located in Indiana, explained Bryan. They are also unaware of the focus on research that began dramatically increasing more than a decade ago (150% increase), and totalling $146.6 million in research awards for fiscal year 2018. The IDEA Center, which stands for Innovation, De-Risking and Enterprise Acceleration, was initially developed to address two critical needs. The university wanted to build a pipeline for commercialization of its greatly enhanced research volume and capabilities while also supporting the South Bend/Elkhart business ecosystem and talent attraction. Today, the center is the primary resource for all commercialization and entrepreneurial activities at the University of Notre Dame. “The PIT” (Performance Instruction Training) is the hub of networking and co-working activity at the IDEA Center, creating collision space for entrepreneurs, experts, stakeholders and students. The center provides the necessary space, services and expertise for idea development, commercialization, business formation, prototyping, entrepreneurial education and student entrepreneurial efforts. The staff is a remarkable collection of accomplished professionals who advise and guide students, faculty and community members through the complex process of launching and growing new businesses. Staffers like serial entrepreneur John Henry (Director of Risk Assessment) and patent attorney and geneticist Karen Deak (Director, Network Engagement Team) offer counsel based on their real-world experiences and successes. Download the IDEA Center “By The Numbers” Fact Sheet and explore the IDEA Center website for more information and resources.